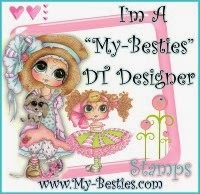 born2stamp: A new card ...A bestie for a bestie. Wow, it's been a long time since I sat down and colored a card. I lost my motivation and my creative ability to sit and come up with any ideas. I tried a couple of times but I just sat in my craft room and stared at my stuff not knowing where to begin. That is until I saw a post from Sherri Baldy showing some of her digital stamps. I couldn't wait to sit down and color one of those cuties. Although my excitement was shortlived when I tried to print and color and the ink smeared. I tried everything...finally decided to buy another printer and it worked. No smearing. So this card was created. I had so much fun coloring this little cutie and making the card. Thank you all for stopping by and looking and a special thank you to Sherri Baldy for these adorable images and for helping me find my creative juices again. this is gorgeous and stunning colouring Julie.